Lionel the Lady Bug has an itch to travel. Click here to play! Join him as he ventures across the world, meeting fellow bugs. If you can meet all of the other bugs scattered throughout several different countries, you'll by flying high with plenty of cash prizes! Stick with Lionel on this trip as this bug will be very helpful. If you spin two to five of his symbol on the reels, you'll get up to 5000 times your line bet. He also acts as a wild symbol, substituting for other symbols to help you create more wins. Take a train or an airplane to your destinations, as these two symbols will help you bring in some money. Five trains bring in 400 times your line bet, and five airplanes bring in 65 times your line bet. Watch out for your insect friends, including the British beetle, the beach slug, the French caterpillar, the tropical spider and many more. You'll want to keep your passport close to you as you travel the world. Three or more of these will trigger the Travel the World bonus round. Spin three or more flies anywhere on the board and you'll be awarded a number of free spins with guaranteed wins. 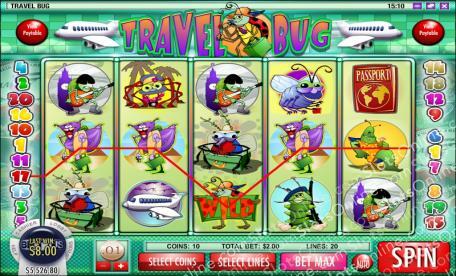 Travel the world with Lionel the Lady Bug for a chance to see all your buggy friends and win plenty of money! The fly acts as a scatter. If you spin three or more of this little guy anywhere on the board, he will trigger 10 free spins in which you can't lose because Lionel expands across the first reel. Lionel the Lady Bug is a wild symbol. Spin him two to five times on an active pay line and you could get up to 5000 times your line bet. He will also replace all other symbols, except bonuses, to help you bring in more wins! If you spin three or more passports anywhere on the board, you will trigger the Travel the World bonus feature. During this feature, you will have to help Lionel fly to some of the destinations on his list to collect passport stamps. Choose which airline you think is offering the best rate for your trip. You'll have a limited budget and once it is spent, your bonus feature ends. You have the chance to win up to 10x your original bet.